I'm using "Targeted release for everyone" for the tenant. Refused to display 'https://login.microsoftonline.com/common/oauth2/authorize?response_type=id_token&client_id=90bee1f7-5e6e-4d8a-9f3d-ecd601259da7&redirect_uri=https%3A%2F%2Fwebshell.suite.office.com%2Fiframe%2FTokenFactoryIframe&state=bb4e8feb-5ee6-472d-acbd-cfed338eae5d&client-request-id=251a4930-9313-4b10-b889-b05f0561f0b3&x-client-SKU=Js&x-client-Ver=1.0.15&nonce=a714d6e5-696b-4058-bd89-5cd421b30576' in a frame because it set 'X-Frame-Options' to 'deny'. So automatic sign-in via the iFrame didn't work. 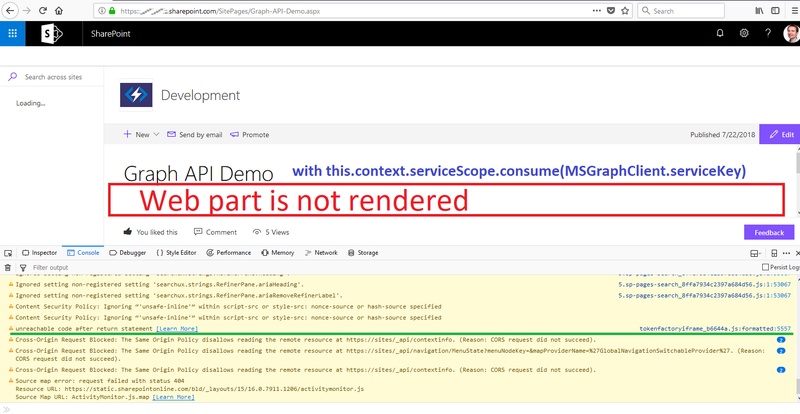 Then decided to "help" the graph by opening the URL mentioned in the error above myself. As a result the error went away, but there is still nothing rendered on the page and I have a ton of new errors now. result: No difference. Same issue. The web part does not render. Update 3 I have installed SPFx 1.6 and I have exactly the same issues. Could not make it work for the life of me. 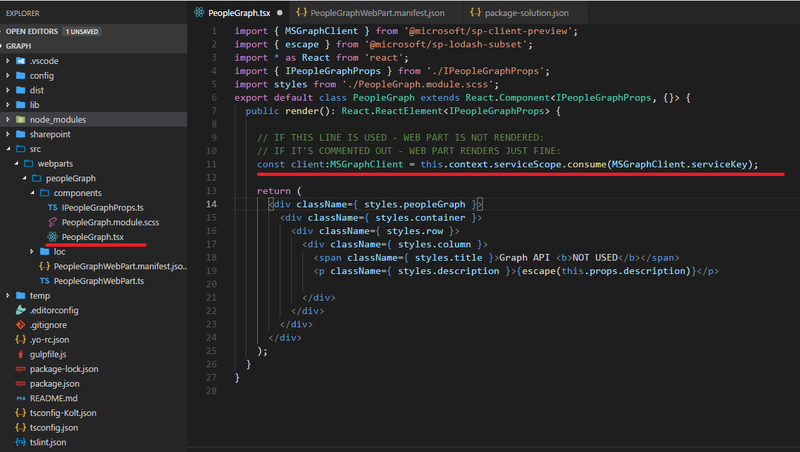 MSGraph is currently in preview. The necessary package for that is available only if you include the --plusbeta parameter during the creation of the solution when you start your yeoman generator. Since SPFx 1.5, these changes have been added. To use the preview packages, we need to use plusbeta flag. The issue was quite stupid and the solution simple. The problem was that I was relying on this.context. and this.context is null (does not exist) inside react components. All the code I was using was meant to be used inside webpart's file. All in all the issue was related my misunderstanding of SPFx. It's not related to Graph. Graph API works like a charm now. I'm really excited about finally using it.